This is a part II of Henda’s series of out of body experiences as she travels through realms. Part 1 can be found here. Thanks to Laron for this information. In this article, Henda and Ben share their out of body experiences. I have been travelling the dimensions through meditations and these are very interesting as I am in a state of trance, my body is present but I am moving my energy through my consciousness. I cannot explain it in another way, other than this. These moments of deep meditations are really important as I can be in parallel worlds through visualizations. I am teleported energetically from where I am to another place. Adar is my totem now and he is the first one who opened the dragons’ dimensions in my spiritual journey. But I do believe now that dragons choose me, to connect to me, and not the other way around. 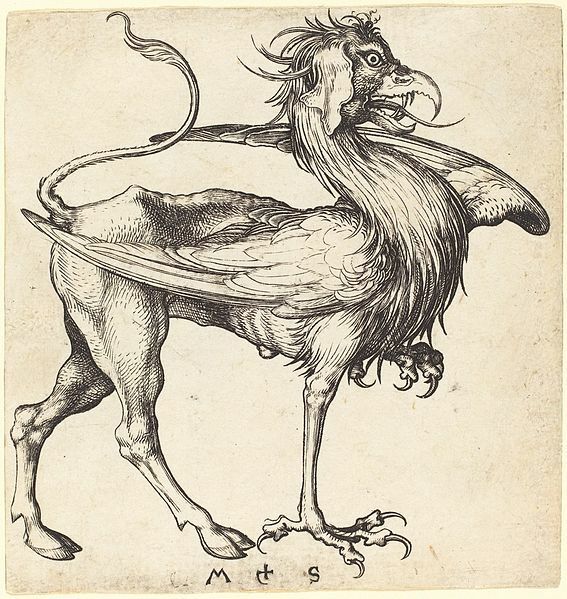 I think it is something related to the past lives of any individual, meaning that in past lives some people may have been in touch with these magical creatures. As I am being visited by some of them, I feel that this connection for me is only for healing purposes. Since I had the attunement with this magical creature, I have been astral travelling with him (My bird is a male). One night, I was meditating and called for him to come. We met as we usually do on the bank of the Loch Ness. He was so happy to see me and I was on his back. As by magic we flew together crossing many seas. He made pirouettes in the sky. I was shivering, feeling the fresh air. The sky was blue and nothing showed up in the horizon. In the middle of a sea I saw an island where we landed. I heard him say, “I am taking you to a very special place.” I would like to note here that he always talks to me in English and that is very amazing. I love his voice and the way he can be humorous and funny. “Here you have my energy in you to help you evolve on your path; I am here for you, you can call me whenever you need help. I am a blue dragon, we are among the most spiritual dragons, and we are peaceful. We have been living for so long in the banks of the Baltic Sea, but we have been exterminated after being used to help humans become stronger, and they put our lives in danger manipulating our energy for their personal benefits. We have been so trustful. The blue dragons have been on Earth many centuries ago; they were living in many countries in Asia. They have a very deep connection to Avalon in the UK and are part of its energy. The blue is their color and it connects them to Archangel Michael who can show up in a blue dragon. They don’t give their magical names to any one as it is their protection. They are of those dragons who protect their energy in their name, but being attuned to it is not given to anyone actually it is the dragon who choose the light being who is able to get it and use it for the highest good of all. I don’t mean they are better than other people, but I know that these encounters and attunements are part of my life purpose. The knowledge is given, but gradually, as I have access to information about these dragons progressively. We were flying over a lake and some forests when three far mountains appeared in our vision. We headed to the highest one and he landed on its snowy top. It was really cold and we saw a passageway surrounded with violet trees which unexpectedly came in our space as by magic. I did not have any name of the place we were as if it had to be secret. Actually, when I don’t receive mindedly the name of a place or a creature, it is a sign for me to know that it is secret and unrevealed. I think that everyone has access to special realms in the multiverse and this is related also to the spiritual path of every person and the gifts we are allowed to have from our journey. I also guess that some creatures have no name but only a subtle frequency which is really their way to connect to the other worlds and to humans too. Some are only energy, as I felt it during the Stonehenge OBE. So when we arrived between the violet trees in that place, a crystal dragon was standing there waiting for us up in the end of the passage way. We were walking but it was like floating there, Adar was beside me in a very protective way. I was feeling his warmth. I thought it was great to have him as it was so cold there. The dragon introduced himself to us and I had his name in my head which appeared with its orthography. I felt a soft cold breeze on me. I was back with Adar and then in my physical body. During that experience I received the divine energy of BRTNK the Crystal dragon, with all its knowledge and power. It is an infinite space where I can go back whenever I need. I know that it can be unbelievable for some people but that energy I received from BRTNK contains an infinite space where I can go back to heal myself, and get information about the Crystalline Earth. There were trees, hills, green and golden grass, a lake and waterfalls. A red brown dragon was flying over our heads as we were sitting on a hill — the lake was not fluid, but massive, and very light too — he moved heavily, bluish and green colored. We flew back to the Loch Ness entering from another portal in the Volcano which opened in one of the waterfalls. We were in a cave as we were entering that cave; there were luminescent particles of a crystalline light, like those we see floating in the air on a stormy or very sunny day. There were these particles of light which are also portals to the multidimensional realms. Adar entered one of them and as he hit that particle we were on the other side, in the sky, back to the Highlands. This is magic occurring every time we are flying together. A few times when interacting with my friend Ben, this came from his own research as he showed me the place I was with the Adar and it is breathtaking. It was Cadair Idris. I was travelling in Wales with the Adar. It sounds that my experiences echoed with his and that we may have a blood druid link to enhance now so that the wisdom of these OBE’s takes really shape and help us on a spiritual level. To understand too that we are not only people who meet on the internet by a coincidence, but for other purposes. The Adar has been and still is part of this process. No other creature of my totems helped that much. During another meditation he came back to me. I love the way he comes on the Loch Ness bank where we always meet! It was so real and he was spreading an indescribable pure energy of love. When he is there it looks as if a world of magic is working on me and I can go anywhere with him by simply allowing things to happen. As we flew in the immensity of the sky, he entered a big bubble of light, and we found each other in another plane. We sat on a beach; the water was heavy and gelatinous. It was like a mass of a heavy liquorish space and when I touched it I could make little bubbles / balls with it. We walked over that sea and did not sink; I was noticing and seeing the energy flowing in that space. “Here you are attuning your energy and improving your healing abilities”, he said. That energy I saw and felt was golden-blue, very etheric, moving slowly in the space and around me, massive and heavy from time to time. Then Adar took me under a fall to wash away old energies I have been carrying for so long. Many times these travels are related to my healings and then to my entity as a channel of healing frequencies from Alcyone. Energy is like water and waves flowing around once we have it inside we are able to watch it and to benefit from it because it becomes part of who we are, of our bodies. It was night and I was trying hard to fall asleep. When there is an out of body experience coming before I fall asleep, I feel dizzy, my physical body begins to struggle to keep me awake, and I also experiencing those feelings that I am falling from above with an electrical shot and tingling in all my body. It was at that moment I saw the Adar coming to me, but he was not alone, there were both my Lion and Black Panther totems. We all flied overseas and mountains higher and higher. We arrived at a very translucent realm where everything seemed to be made of a thin translucent white material. We landed in a very vast place between low constructions like homes, but there were no one, no physical creatures like humans, but some multicolored bubbles leading to different dimensions. It looked like an etheric world in between many worlds. Everything was made of pure energy, a crystalline and pure light world. There were no smells, nothing we can touch with our hands and physical senses. It was white immense filled with invisible creatures in the shape of bubbles which had different colors. Adar told me that it was a cloud city; he said that they are not the same, as every one of these realms and cloud city has its own energy, own frequency. He also told me that this one was the purest one were souls live in the shape of bubbles. They can be different kind of souls from humans to Extraterrestrials, animals, trees and so on. Every bubble has a frequency that allows it to connect to the higher frequency of this world as to the other souls. It is shown with the colors of the bubbles. I saw violet, pink, green, blue, white and yellowish golden bubbles. It also provides the earth now with its energy sending white pure etheric frequencies to heal and to clear those who are ready for this transition. My two totems turned white there and the Adar too. I saw myself like a big white bubble moving in that place. There was no sounds, no noise. Nearby that place we landed, which seemed to be a central district or city, there was an immense portal rainbow colored, inside of it the colors were turning in a spiraling way: it was a star gate. I remember being in-between a semi-conscious state at the beginning of the OBE, as I was in-between an awake and sleep state. Then the rest of this journey happened when I was asleep but I was fully conscious of what was happening. It looks so beautiful knowing that during an OBE, after death too, we can be in that space filled with peace and calmness. The name of that city was not revealed to me, as it is kept secret for now. But it seems that I can go back there to experience the new energies coming on Earth now, and to know much better how it is functioning. This experience has been enhanced because of what my transient friend Ben experienced. I don’t have any idea about it but I know that mine occurred last August during the Lion’s gate opening portal. I guess this will be the beginning. During a morning meditation, a few months ago, my Black Panther and my Tiger came to me. I was with them in a Jungle, somewhere in a parallel world. We sat on the ground and I was in-between the two creatures. It was a very peaceful place where we heard birds singing. I saw a very big screen appearing a few meters in front of us; a portal opened. We were suddenly in the screen within that moment, then a new portal opened surrounded with green emerald plants shaped like thick braids. We entered that gate and walked into an immense land where the sky was yellow and the grass yellowish green. She blew a very soft energy on me and then it was much more exciting entering from my lower energetic centers (my chakras) to the highest ones. She took me on her back to show me her land. She sent us back to where we were, in that place on the ground in that jungle, and the screen disappeared. I stood there with my Tiger and Black Panther exchanging our energies to get attuned to the Yellow Land. That time the Adar took me to a cave in a sea near by the Highlands. We entered by the sea and I saw a white portal opening which led us to the cave. A red dragon was waiting for us. “I am the red dragon of the Celestial Gardens my name is N* and must be kept secret. You are here to be attuned to my energy, and will receive the knowledge which is held in it”. He blew fire on me and a red bubble surrounded me. I felt myself projected and the bubble was spinning and didn’t feel any heat. The energy was very soft and fresh. We were then projected out of the cave by a crystal portal which led us to a forest. We flew away with that energy inside. The red dragons are keepers of the Celestial Gardens which are in many places on Gaia and connected to the grids and lay lines of the multiverse. They have infinite powers as healers and can call up on the Elders of the highest spiritual realms. They also have access to the Ancient Wisdom and Knowledge and Gaia’s goddesses are at their service. The Celestial Gardens are open to those who are healers and all light workers. They carry the healing energy of all the other dimensions. The Red dragons keep secret their names like the blue ones. They are definitely earth bounded beings and can live in many places on Gaia but in hidden parallel worlds. They are now helping with the tectonic movements of the Earth by using their energy, as the shift is part of it. When I came back in my physical body, from that trip, the energy of that plane was still working on me and I felt tingling and vibrations in my hands while writing this experience. A few days before that OBE an old tree had been cut here in the park of my district In France, because its trunk was cut in two and it was dangerous for people. I used to heal it because of his leaves which were taking time to show up during the last spring. The tree was cut in many pieces and I felt its sadness. My hands were burning for his departure. Trees have special souls, and I was helping that one to pass, partly to its spiritual home. The tree told me that his roots were kept in the ground and that he was in-between dimensions in a much more effective way as part of it was disconnected from Earth. But once the roots eaten by beings of the underworld, it will be completely back home. So as I was in that plane called the “Kingdom of Flowers and Trees” I was taking a tree in my hands and it was very little. With a touch of my hand, the tree was planted in the field. It was like a wrack or bonsai — so little. My hands passed over the branches then over the trunk and I could feel its energy flowing in me and around in the field where I planted it. The soul of a tree is like a fluid energy, but very consistent. It moves in circles and a spiraling way. It is not an earthly but a multidimensional soul which can incarnate in another plant or another type of a tree once its life on Earth ends. But this does not prevent it from keeping in touch with all the planes it has incarnated in. When they leave a dimension they are very emotional. I actually could feel the sadness of that tree in my park all around the place; its soul was there over the pieces of the trunk and heard a discussion with the other tree which was near (It is the Avalon tree I draw few times later). The soul of the tree told me that it was not all gone and that I will always keep the connection to its energy even from the other plane when part of its soul will leave this planet. “I will be home in more complete way”, were the words I heard. Trees carry on helping the earth from the kingdom of Flowers and Trees. Flowers are the essence of their energy; they are their power, that’s why the trees have flowers in their branches when they wake up from their long winter sleep, and that’s why that plane is called that way too. I saw many bright colors which are available in several colors I cannot describe. I was very thankful to my guides who allowed me to help that tree during an OBE. Even trees are sad to leave Gaia. This was new and amazing as I could never imagine before that trip all this could be possible and real. I was channeling the information. I felt my hands were warm and vibrating: the soul of that tree is yellow golden, it is pure light in a liquid light, as if you were under the sea watching the surface of the water from beneath, it moves in spirals, doing little circles all around the surface. This was very cool to watch. The soul of a tree is a unique energy in the multiverse. And that kingdom is a liquid world where you see everything glowing in a very attractive manner like watercolors. This OBE helped me understand better the entity and soul of the trees. But I guess that their knowledge is not yet all given. They did not yet deliver all their secrets. I first felt my body shivering from my head to my toes. Every part of it was in a deep trance. I had the message few days ago that there will be a visit to Stonehenge, that place I visited in physical during a travel to London on July/august 1985. I stayed there for two weeks and it was an amazing experience with many foreign groups. So that morning, I was calling the spirits of that wonderful place. As they were coming my way I did not feel any physical presence, but that very deep trance which is kundalini energy. I was out of my body with much ease. A moment after I was sitting on a beach, the sea was calm and the sand was white. It was not yet morning there. “Stonehenge is not so far”, I heard. I thought of a twin soul or a spiritual guide who was there for help and care. Then I was projected again and saw these huge stones. I felt warmth as if two strong arms were holding me, taking me and flying with me. We flew over and around the stones in a circular way. I saw them from above. Below, as we rested on the ground, there were many little stones and a lot of fresh grass. But it was warm. My helper took me back. We moved in a circle around it and I was back in my physical body with much softness as if I were a leaf entering a big box. These are parts of the experiences I had from the empowerment I received with the energy of the Adar. I’ve discovered lately that it was related to the dragons’ energy and Merlin’s energy I hold in me from previous lives. 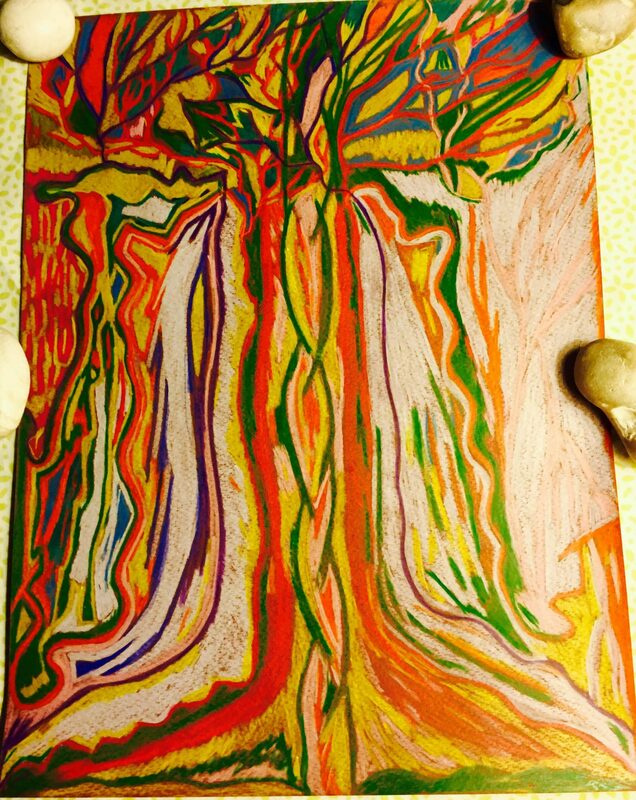 It also explains why I have been drawing these trees as I feel a bond with the fairy’s’ realms which has been enhanced with another attunement I did before my QHHT with my friend Laron in Texas, and that past life regression showed me a connection to trees and a past life as an artist. Furthermore, I also began to see synchronicities with some folks in Transient.info group and that is why I will give here voice to my friend Ben Woodhead, as he is the best choice to explain the druid energy which connects us. He had some amazing dreams, OBE’s, gaining information related to my experiences here. Firstly, thank you Henda for such an insightful, personal and vivid explanation of Dragon energy and secondly, for inviting me to share my experiences too. Before I begin what will be one of the most personally important collations I have ever attempted, I feel it’s important to give a small background introduction to the nature of mine and Henda’s kinship so far as (I’m sure you will see) it is pertinent to the information she and I share here, chronologically speaking as well as inherently. Most of the notable spiritual connections I have made with other people in this human life have been recent (in our incomplete measurement of time/moments) and those have transpired through transients mainly, and the beautiful beings I’ve met. As I move through this in the closest “order” I can recall it, you will see how my experiences have been very specifically linked with Henda’s of late, which has left both of us in no doubt that our experiences with Dragons have been synchronous and inevitable. During early healing sessions with the transient group, Henda made herself known to me and has been a regular visitor during my time out of body, whether though the dream world or in meditation. There are only so many times that a stranger can show up in these states before one has to take note! Well…very quickly that stranger became a friend, a teacher, mentor and spiritual companion. Our affinity with trees was inherent to both of us since childhood, a sense that has grown, like we have as beings, only to rear its head again in our union through Dragon energy. As a Druid, (albeit in training!) I see the energy of animals, humans, trees, oceans, rivers, mountains and people as the manifestations of larger energy beings that move through the current moment in order to create that which we experience in everyday life. It is of absolutely no coincidence that Dragons are held in the highest regard by the Druidic community, not as the stuff of legends but as the serpentine energy that moves betwixt all living matter. This energy is the microscopic mechanism and the macroscopic effect in action…perpetually…and always. As such, our ancestors commenced the folklore and legend that remains with us today and for good reason. The Dragon energy is permanent and cannot be removed, revoked or rebuked. However, it can be manipulated (and has) by those who have arcane knowledge of what it is and where to access it: Many of the Neolithic sites that anchored it remained untouched by civilizations and sit proudly astride our Ley Line planetary grid to this day, untouched. I wonder why…those same civilizations were happy to desecrate local sacred sites such as smaller stone circles, monoliths and also secular settlements but clearly not the megaliths that anchor the entire planet’s grid? That in itself is evidence of a stratum of knowledge and limited hierarchical access for thousands of years that remain today. Dragon energy is adept, dynamic and mobile in its permanence. It manifests through the movement of celestial bodies and transforms our living picture on a daily basis. Our Ley Lines have been structurally honored by their presence for thousands of years in the archeologically measurable “moment” we see around us. In Britain we have a particularly condensed concentration of Ley Line convergences that has held our small islands in reverence by the rest of the world for good reason and I include North West France (Henda’s home at the moment) in that, since it has always been a place of Druidic practice just like the rest of the British Isles. It is also no accident that St George was to slay the Dragon (depicted by the Welsh Red Dragon and viciously commemorated by the blood red Christian cross in the English flag). As Henda has eloquently described, Dragons do not reveal themselves to anyone until that being is ready to understand them and even then, in secrecy. I had an incredible dream experience where I saw Henda in a field of plants, about as tall as her. They had bubbles upon the tops of the stalks/trunks and she was tending to some of them with small pieces of cloth. When I approached her I was able to touch one of these bubbles and it instantly transported me inside it whereupon I was in a swirling bliss of tangible, serpentine energy. There were many beings present within the bubble and it felt as if the sea was the air and the laws of physics did not apply. The closet thing I can describe the beings as is amphibious dolphins but that description does not do justice to the imagery. Within each bubble was a world in itself and yet interconnected to the other bubbles through the beings within it, through its trees. Each one of these plants had a spiraled energy moving up its stem like kundalini up a spine, like Belinus and Elin up the Axis of Britain, like the medical caduceus. I was able to withdraw my intentional observation within and without the bubble at will and I became quickly aware that I was being deliberately shown this by Henda. It was only later that I realized why. Once one has been shown Dragon energy in effect at its raw source it becomes apparent that it is everywhere, especially in the twisted sloth of an Earth tree. You can physically see the process of kundalini rising in the drudgery of its bark that jokingly does nothing to betray the secrets within other than to those who have seen its patterns from inside. In the weeks that followed Henda began to paint trees in energy form as visual representations of what was happening within and without and we began to converse on the patterns we saw. Every time (without fail and I may I refer you to her paintings) there were clearly internal kundalini movements up the spine (trunk), autumnal fractals of energy falling to ground under the canopy (leaves) and Dragon faces within (energy). Each picture depicted a “day in the life” of a tree that spanned a whole year, or rather: One breath of a tree in a Universe of connectivity, facilitated by the beings that move through All: The Dragons. During an intense ritual experience I was shown the Citadel of Dinas Affaraon also known as Emrys. The city is crystalline and its’ existence on our perceptible plain is tangible, steeped in myth and very real in Snowdonia Wales (close to the Merlin Ley Line). It is the alleged site where the White and Red Dragons were buried within the land by Lludd (a Saxon ruler) in a pool of beer who heard them scream every night on Beltane (the sister spirit night of Halloween/Samhain) as they fought. This was of course untrue and the nature of the scream was more indicative of entrapment as they wrestled to weave their way through All. Merlin (Myddrin/Myddryn who is now my guide) dispelled this imprisonment and freed the Dragons so that they may distribute their energy through the land. Upon doing so the Dragons were free to construct and build actual matter as they saw fit and create the crystalline city that both Henda and I have been shown. Our affinity with Merlin energy becomes obvious at this point, despite a seemingly unconnected one to us at first. Whilst observing Dinas Affaraons’ structures one can move between inside and outside, just as we did within the field of bubbles. In this sense the city can be thought of as a cloud city; it is above the location in vibration, transitory and air-like like clouds and only accessible through hidden entrances that are deliberately guarded to prevent the same kind of abuse that was previously attempted. It’s important to note this last point, since there is no aristocratic agenda at work here where only “some” people are shown the way in. It’s hugely encouraging that Dragons are willing to do this once again and none coincidental that Merlin is (yet again) involved in both mine and Henda’s experiences. It is also important to note at this stage that archaeological evidence from the site has revealed a hidden pool that is buried within the ruins of the proposed location. 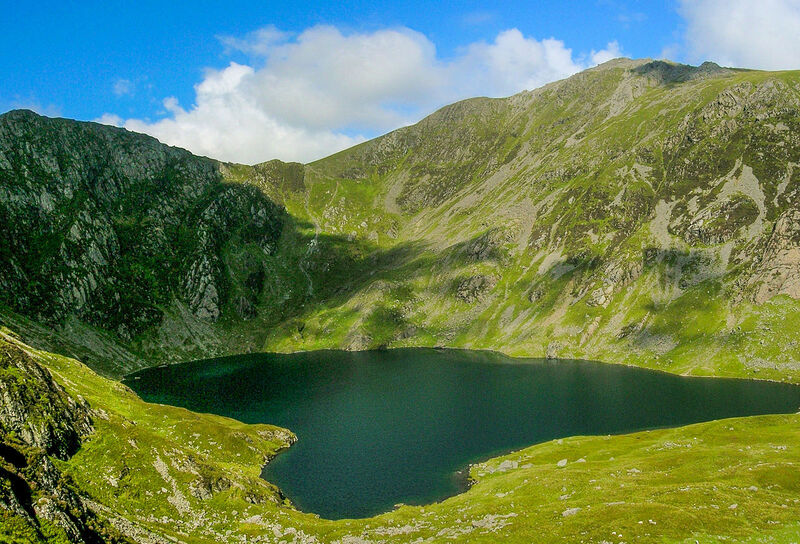 There is a lake in Wales called Llyn Fan Y Fach where The Lady of the Lake presented Excalibur to Arthur who restored sovereignty to Breton (Britain at the time/”moment”). It is located within the Brecon Beacons mountain range in Wales. The Black Mountain area also hosts Llyn Cwm Llwch that translates as Lake Valley Dust. Here was the key to unlocking the secrets that lay further up the valley of dust in the cauldron of wine/beer (Llyn Fan Y Fach) that creates the crystalline city of Dinas Affaraon: the visual, energetic representation of Dragons that still persist after eons of creating our very fabric of matter of life. Through totally different experiences we have encountered the same guides, the same beings, the same places and had their true nature revealed to us through the fabric of our current organic matter: trees. There is so much more to say but for now I hope we have enticed you to entertain that deep buried part of you that has always known this but never collated your thoughts on it. I’m increasingly finding that it’s important to help those who cross your path with meaning as they help us. In this openness we align ourselves with the synchronistic energy that the Dragons create and allow them to move through us. From our perspective if you seek you will find answers. We may well see you (t) here! As ours’ Elves! And that cauldron of life, (the Holy Grail) that some seek to hide and repress, cannot simply stop Be-ing. It just Is. A big thank you to Henda for the opportunity to voice this and for walking the path with me! After reading Ben’s part in this article, I felt as if something really cleared the path for me. But that began some time ago when we discussed the topics of my OBE’s and trees. We are given such experiences to learn from our deepest truth and from our inner soul. And while meditating with the Adar he came once more and took me with him. My whole body was shivering and we flew on the right side of the Loch Ness. We entered a cloud city where everything was only energy, a crystalline energy, and the white dragon was there waiting for us. I knew intuitively that he was waiting for us to come. He was greeting us and told me that he knows Ben has been there too for this connection is given to every one of us to work on an energy level in the process of spreading Light and Love through the new Terra. The Dragon started moving his huge wings and I was watching a stream of white energy flowing from out of them and directed toward me. I received that new energy that day. Then we entered a very big bubble which was trans-lucid and we sat all three in a wide green place feeling a deep healing occurring in us and fire was burning in my two hands. Then the white dragon asked me to close my hands. When I did the energy started flowing from my hands to my arms, then to all my chest, body legs and feet, it made another movement from down to up making a spiral and a red bubble was surrounding me with a very dynamic and strong energy. He said, “this is the energy of Gaia in you. Take care of it naturally everywhere you are” and he sent us back to the banks of the Loch Ness. My connection to Merlin was shown to me during a past life regression I did through a meditation with my guides and they showed me one past life I had in Broceliande (the forest where merlin is buried in a subterranean cave by a witch he loved so much). My guides told me that Merlin helped me with energy healing during that life as I was a black female of an alpha wolf and was living in a pack. They showed me a very clear vision a black wolf bringing an animal he hunted for me and our little babies I was also feeding with my breast milk. They also showed me the mother I have been and the importance of this instinct in my current life. That helped me to receive from Merlin, it helped my soul to evolve during my spirit journey after my death. I received that energy which has been meant to be part of who I am. That place in France is 400 km’s away from where I live now, but I feel an intimate and strong need to go there. I also saw that connection to Merlin during my QHHT with my friend Laron in Texas. During an Akashic reading with my friend Anne a few weeks before the trip in Houston, she told me that I have in me the power and magic of Merlin and that it is going to grow stronger in me in this lifetime. Back in July this year I asked my friend Dean Kingett, a Master Reiki Teacher and a Healer from Hessel, to do an attunement with Merlin’s Magic. When I connected to Merlin I saw myself in a forest; and he came toward me. He was very tall and had a wood stick in a hand and a magic wand in the other one. He came just in front of me smiling, he had brown hear, blue eyes and was wearing a white long robe, which reminded me of my first encounter with Jesus. I was receiving a flashing white energy that was surrounding me. I felt it deep inside me and it was like a beam of light that invaded the place I was standing in. It was very soft at the beginning. I saw suddenly a chalice in front of me moving slowly with a red liquid inside of it. As it came just in front of my mouth, I drank it. The chalice was moving again and was floating on my left side, then I saw a sward over my head, the energy was turning making the infinite over me around my energetic body. I could see green, purple, yellow orbs and lights moving too. Merlin was moving the sword and the chalice with his fingertip and was floating over me and turning doing the infinite. The energy became stronger and much more intense. As I open my eyes, he calls me back and I felt the energy in my chakras from the top of my head moving like a wave and from my front to back side in every center of my energetic body, drawing a serpent of energy in a multidimensional shape. I could see the different parts of that energy as it was moving again from under my feet to my head and a very powerful shift happened in me feeling much ecstasy as that energy was very exciting and dynamic. I saw merlin smiling before he disappeared. I connected to Merlin during an OBE, after the last trips with the Adar and the text my friend Ben sent me for this article. I saw him coming back in that forest that same place where he healed me as a wolf and where I received the attunement with his magic. It is common that these beings from the other realms when connecting to us always meet us in the same places. They have a fixed space as if they were really part of their own realm. Merlin showed me the different stages and phases I have been through since I have been conscious of his energy and spirit in me. It was like a rope with different and successive knots, each knot corresponding to a phase of my consciousness through this process. It was really powerful as a symbol, and comforting when it comes to my spiritual growth. Things had been moving so fast actually in my life and I am sometimes asking myself if am not going to become dumped. Hopefully Ben came to help me and to show me physically through these places which are really part of the English landscape and deep ancient culture that I was not dreaming, imagining, or creating these beings and places. All is real but happening in a multidimensional level, as I can enter and cross the druid and fairy realms with the Adar and the dragons and Merlin. All is connected and we are all able to reach wisdom from where we are in an unexpected way. I want to thank Ben for the energy he provided for this work so that we can all share what we experience. I stay convinced that these experiences, though they may appear unreal for some people, are the truth deep inside, and are signs of the call of the soul when it comes to be guided on the spiritual path. We will stay attuned to part three as Ben and I will carry on providing you with more shared experiences from the druid space and realms. You can find part one of this three part ‘Travelling Through Dimensions’ series, here. This work is licensed under a Creative Commons Attribution-NonCommercial-NoDerivs. You’re allowed to share this article in full for non commercial purposes, but you must not edit or modify the contents. You must include all links, as well as this licencing information, and provide appropriate credit, including a link leading directly back to this article.